The sei (pronounced "say") whales are among the more elusive of the larger whales, not coming very close to land at any time and not forming large groups or "schools". They are found like many whales in both Northern and Southern hemispheres following the best feeding at different times of year. Only the larger older individuals tend to go very far south, they are relatively rare in Antarctica. 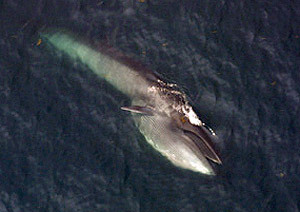 Sei whales favour temperate, deep offshore waters more so than other species of large whale, being rarely seen inshore. In the summer months, sei whales do not move as far towards the polar waters as other rorqual whales and do not usually enter icy water. This is way the large rorquals avoid competition for food resources, each having different feeding grounds, habitats and prey preferences. Sei's skim feed on copepods (zooplankton) and other small prey, rather than lunging and gulping like other rorquals. This largely explains the relative fineness of the baleen fringes in the mouth which act as a filter to remove small prey animals from the sea in this species. They also have only short throat pleats which are used to allow the mouth to open to gulp in water and prey as they are not needed in this form of feeding. 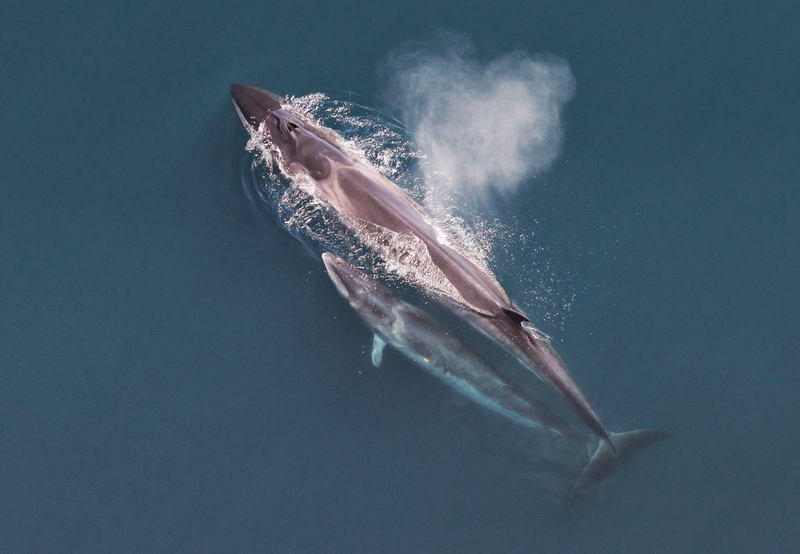 Sei whales have less and relatively shorter ventral throat grooves than blue, fin or minke whales, from 30 to 60, and reaching down to midway between the flippers and the navel. The largest baleen plates measure 75-80 cm and there are from 300 - 400 on each side of the jaw. Picture left - Sei whale surface feeding, note the extended throat due to the pleats allowing the skin to extend. The back is often mottled with scars - probably from cookie-cutter shark bites. Sei whales are often seen in groups of two to five. They are fast swimmers, possibly the fastest of all cetaceans (whales and dolphins) reaching 50 kmh (31 mph) over short distances. When slow moving Sei whales surface, their blowholes and dorsal fin are often visible above the water at the same time. Feeding Sei whales tend to dive and surface in very predictable series, often remaining visible just below the surface between breaths. Calving occurs in midwinter, in low latitude (closer to the equator) portions of the species' range. Photos used courtesy of NOAA.